Mobile Legends new Hero, Yi Sun-shin – What Kind of Skills He Has? Mobile Legends Bang Bang notified all players a few days ago about their new and upcoming hero Yi Sun-shin (Yi Soon Shin). The name appears to be a famous national hero in Korean period who won most of the naval battles and invasions during his time. You can read more about his story in comic books and online documentaries. 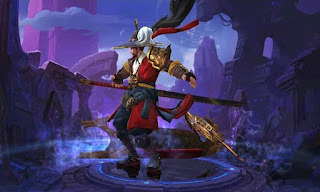 Yi Sun-shin as a legendary warrior uses glaive and bow as his weapons to fight the enemy, in Mobile Legends what kind of ability, skills and role he has? Do you have an idea about this new hero? For now, we’ll try our guessing skills on what we can expect about Yi Sun-shin. Yi Sun-shin – Fighter, Assassin or Marksman? With the video teaser, you can see that Yi Sun-shin has two weapons. First is the glaive or sword that reminds us of Yun Zhao and Alucard, the second is the bow just like Miya that can hit from long range. Since he is a naval warrior, we can see a something like warship right beside him (see above image) that may be a part of his skill. By watching the clip you can complete a guess from first, second and ultimate skills. If you can buy Yi Sun-shin during the availability or release tell us your favorite effective build. Do give us also your experience with this new hero. Hopefully we can purchase it with discounted price via battle points.